You all know what it looks like. 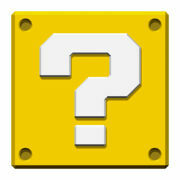 The Box with a question mark was probably born when some shady trader decided to prey on our heroes' gullibility. Not many people considered this artifact as special but when a chubby Italian plumber began his quest to save his girlfriend from a giant turtle, everyone saw what the artifact did, and boy were they amazed! Since they saw him grow in size and strength by eating the box's contents, all of the heroines began searching for these boxes. Unfortunately, the box worked differently for the heroines, probably because it was not used to being carried away in a bag by scruffy little good-for-nothings. It seems the effects differ for all heroes as indicated below. 07:22 Felt a burning desire to open the Box with a question mark. Found inside something unbelievable — a scroll with instructions on how to get a premature level up! There are many possible outcomes of activating a Box with a question mark[BB 1]. Nothing happening. If your hero has not completed their temple, the annoyed hero tries to break the Box with a question mark with a golden brick resulting in the loss of the item and the golden brick. If the temple is complete, nothing happens but the loss of the artifact and expenditure of godpower. This page was last edited on 4 April 2019, at 14:58.